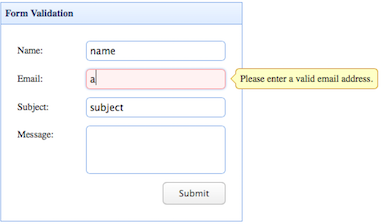 This tutorial will show you how to validate a form. The easyui framework provides a validatebox plugin to validate a form. In this tutorial we will build a contact form and apply the validatebox plugin to validate the form. You can then adapt this form to your own requirements. We add a class named easyui-textbox to input markup to create textbox components that will be applied the validation according the validType attribute. When users click the submit button of form, we should prevent the form to submit if the form is invalid. If the form is invalid, a tooltip message will show.